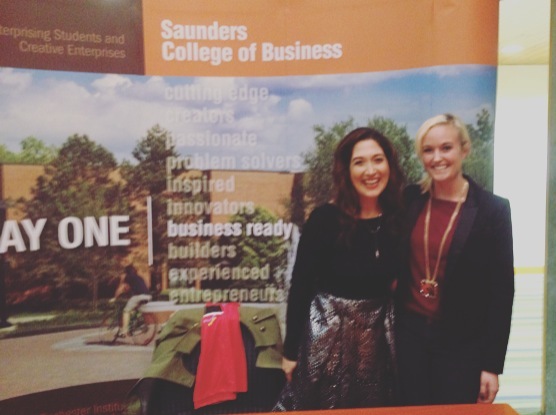 ROCHESTER, NY (October, 16, 2015) — The ambitious, sassy and entrepreneurial Randi Zuckerberg discussed the opportunities and trends in technology during the Gasser Lecture Series, hosted by the Saunder’s College of Business at the Rochester Institute of Technology (RIT). Today, the opportunity to succeed relies heavily on involvement with technology. Radi discussed three things you can do achieve success: (1) participate in a hackathon, (2) pay attention to your brand, and (3) get hooked on technology at an early age. Everyone should “participate in a hackathon,” said Randi. Hackathon are events that drive out-of-the-box thinking and problem solving. “Hackathons allow people to eliminate the fear of failure,” said Randi; when people feel as though they can speak freely, they share ideas more often and more openly. Companies such as Intuit, Facebook and Google host monthly or yearly hackathons, of which frequently produce the most innovative and thoughtful products to date. By displaying original thinking during a hackathon, or at your current job, people will admire and appreciate your unique perspective; you’ll always be someone who brings new ideas to the table. Next, Radi discussed the importance of “paying attention to your brand.” Companies, such as Amazon encourage their employees to “respectfully challenge decisions should they disagree.” It’s important to think differently than others; a unique brand is the most important thing you can have. With the opportunity to interact and “post in real-time,” with social channels, such as Facebook and Twitter, people can get ahead of trends (and their peers), said Randi. Your online brand is how people perceive you, so pay special attention to it. While on the subject of your online presence, Randi urges that you to “get hooked on technology at an early age.” There are so many opportunities that a knowledge of technology can provide. Not only can people learn to build technology, but people can learn to solve problems using technology. “(As we’ve seen with Facebook), advancements in technology can change the world,” said Randi. Some of the most successful tech companies have started with young adults, such as Box, Facebook, Twitter, Snapchat and Pinterest. If you become immersed in technology at an early age, you’ll gain skills companies look for when hiring; an innovative and forward-thinking mindset, and a fearless attitude. Wouldn’t you want to hire someone like that? This entry was posted in Entrepreneurship and tagged Amazon, Box, Entrepreneur, Entrepreneurship, Facebook, Founder, Get Hired, Google, Intuit, Job, pinterest, Randi Zukerberg, Snapchat, social media, Tech, technology, Techpreneur. Bookmark the permalink.